Some have called silver the investment vehicle for the masses. Even with the price rises, silver remains more affordable than gold and is more accessible than gold. Looking at the U.S. Mint product line, the consumer has more silver options than gold. At some point, the U.S. Mint will actually sell the American the Beautiful silver bullion coins that seems to have garnered a lot of attention. Silver has a long history as being the most popular metals for coins. From Ancient Rome to the Spanish Pillar Dollars that became the basis of United States currency, silver has been the plentiful and desirable metal used for coinage. Once silver became the base metal of choice, the United States spent over 100 years manipulating the composition of coins and silver prices in an effort to support silver mining concerns of favored members of congress. I like silver coins. Silver has a silky color that allows for striking designs to be very visible. Because silver is less dense than gold, a one ounce coin made from silver are larger than gold. For example, most gold bullion coins are around 28 mm while silver coins average 38-40 mm (the Canadian Maple Leaf is 38 mm). It translates to more surface area for beautiful designs. I collect a few silver bullion coins. Aside from the American Silver Eagle in proof and bullion versions, I also collect Canadian Maple Leafs, British Britannias, and China Silver Pandas. Silver Pandas are very interesting. 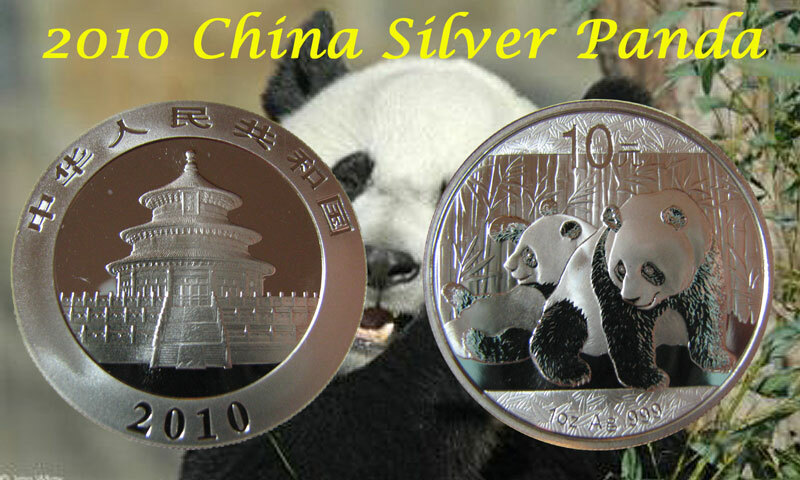 China has been minting the Panda Bullion coin since 1983. The obverse features a panda in various images in its environment. Every year (except 2002) features a different panda image depicted in its natural environment. The reverse is The Hall of Prayer for Abundant Harvests in the Temple of Heaven. There have been four versions of this design (1983-1991, 1992-1999, 2000, 2001-present). There have been three generations of Pandas and a single “different” issue. Generations are based on content and changes in design. The claim is that 2010 is the last year of the current generation since there may be a slight change in the works along with a significant increase in production. The People’s Bank, which governs the creation of coins in China, is planning for a 10-fold increase in production. It is conjectured that since the price of silver is so high that the premium they charge because of the popular designs can bring in more revenue. It is uncertain whether this will be a successful strategy because those who studied microeconomics will tell you that an increased supply without an increased demand will push the prices downward. The U.S. Mint discovered this a few years ago and reduced the number of products offered. Recently, I picked up the 2010 Panda to keep my Third Generation collection complete. The Third Generation Panda designs are distinctive in being more realistic than previous designs with fine details as part of the design. Gone are the cartoon-like panda figures allowing this generation of panda designs to appeal to a wider audience. These are wonderful designs and something that shows off very well on the 40 mm silver planchet.